Ours is 2025 Magazine St. in the Lower Garden District of New Orleans, Louisiana. The feeling of a perfect Sunday: calm, sunny, and clean, white linen billowing in the breeze from an open window, jazz playing, incense in the air mixed with lemon and herbs, fresh greens and flowers from the garden all around, something roasting in the oven... Sunday Shop is a holistic retail experience for all of the senses. Every brand carried at Sunday Shop was carefully researched and selected based on our belief in the products and the philosophies and stories behind them. Gracing the shelves of Sunday Shop is a carefully selected collection of home accessories, textiles, furniture, art, fragrances, candles, florals, and botanicals that can be purchased as the perfect gift, or finishing touch to a room. Whatever it is you are looking for, you will find something that satisfies at Sunday Shop. 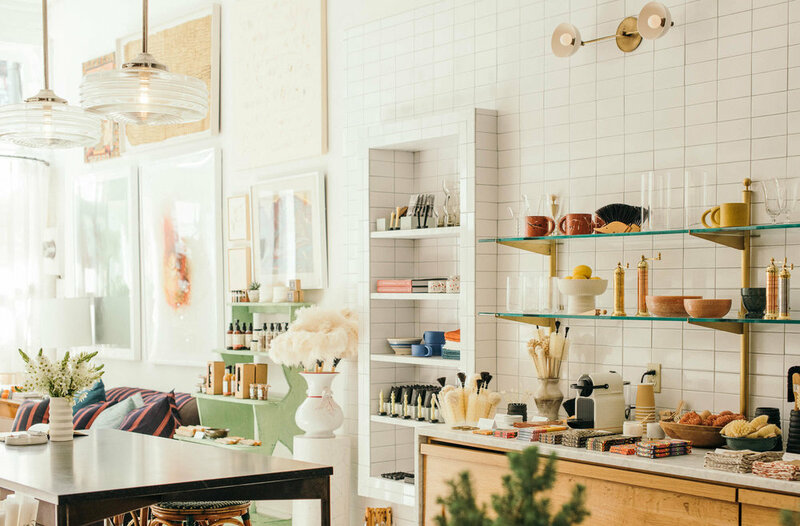 Katie Logan Leblanc and Jensen Killen are passionate about good design and how it improves our daily lives, from the perfect paint color to the candle that makes it feel like home. Sunday Shop is a direct extension of LKI - bringing you some of the best in furniture, textiles, fine lighting, and art. At Sunday Shop, we aim to provide you with all of the information you need to find the most perfect addition to your home or unique gift for someone special. We love and believe in all of the brands we carry and know them inside and out. Not sure what you're looking for? We offer custom gift boxes assembled by us that provide the perfect combination for any occasion. Looking for something one-of-a-kind? We have an extensive collection of vintage pieces available in-store and browsable on our website. See something you love? Fill out our inquiry form and we'll bring you together! Not looking for anything in particular just yet? No problem. Come into The Shop and help yourself to an espresso, take a seat in our lush courtyard, and give yourself a moment. Indulge yourself with lavender lotions by Los Poblanos, take in the aroma of a Byredo candle, and come back to see us another time when the occasion arises. "...the Lower Garden District is a neighborhood ripe for discovery, filled with architectural gems, magnificent old streets, interesting residents, and a rich cultural heritage that only gets better with time."